If you already have Proposal Kit Professional then QuoteWerks is the perfect compliment which adds pricing and quoting automation to your proposals and contracts. QuoteWerks is a third-party application sold separately by QuoteWerks. Download a demo of the QuoteWerks software. Proposal Kit Professional provides thousands of pages of proposal writing content, graphic design options, graphic cover designs, legal contracts, complete sample proposals and Wizard proposal assembly and management software. 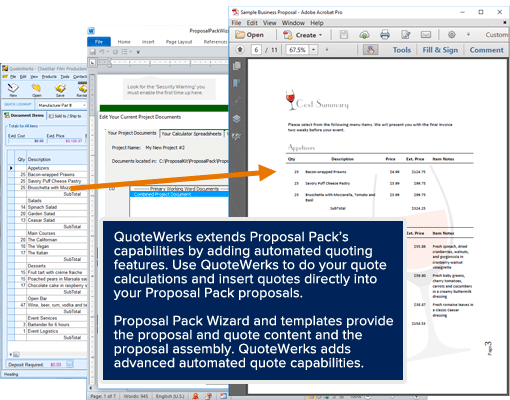 QuoteWerks adds advanced quoting and pricing capabilities which inserts automated quotes into your Proposal Kit proposals. While Proposal Kit Professional and QuoteWerks are independent and stand-alone applications, you get the most capabilities and features using them together. A complete set of development files showing exactly how to setup QuoteWerks and Proposal Pack Wizard- Expert Edition together to create proposals such as this sample are included in Proposal Kit.